Agaricus blazei Murill (subrufescens) is an edible, medicinal mushroom with characteristic, somewhat sweet taste and the fragrance of almonds, that has traditionally been used against a wide range of diseases, including cancer, chronic hepatitis and diabetes. It’s also known under the names of Almond mushroom, Cogumelo de Sol, da Vida or de Deus (mushroom of the Sun, Life and God) in Brazil or Himematsutake (princess matsutake) in Japan. 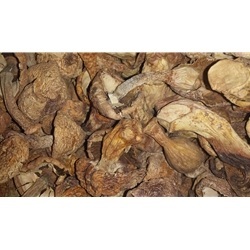 Agaricus blazei Murill is a species of mushroom with widely recognized medical properties: it contains a symphony of compounds known for stimulating the immune system. Today new possible applications of the fungi remain a subject of ongoing scientific investigation. Agaricus blazei Murill was discovered in 1960 by Takatoshi Furumoto, near a small Brazilian village Piedade located in the highland areas of the Atlantic forest near Sao Paolo (Brazil). According to legend, the elderly people in this region were less likely to suffer from serious diseases than those in the neighboring communities. Because of its alleged health effects, it was brought to Japan and subjected to biomedical research, which confirmed the mushroom's richness in immunomodulating substances such as β-glucans. Since that time it has been widely cultivated in Japan for medicinal purposes. Based on DNA sequence analysis (rDNA ITS region) and on mapping studies and genetic analysis of hybrid progeny, there is a strong case for co-specificity of the Brazilian mushrooms with Agaricus subrufescens. Based on a study of the type and other data, the recent lecto typification of A. subrufescens is widely accepted. Since the time the mushroom became subjected to intensive scientific research some 35 years ago, it has become widely known. Scientific studies have focused mainly on the effect of ABM as an immunomodulating agent, and its therapeutic effect in connection with infections and cancer.